This Saturday afternoon, join in the 10th Annual Worldwide Knitting in Public Day. The event was conceived as a way to take knitting, usually a solitary act, into the public sphere. Through meetups like Worldwide Knitting in Public Day, knitters can meet others with similar interests, share materials and advice, and hopefully entice newcomers to learn to knit. Knitters bring their art outside. The event truly deserves the "worldwide" moniker, as there are hundreds of knitting gatherings in celebration of the day in America, Asia, Europe, Africa, and Oceania. 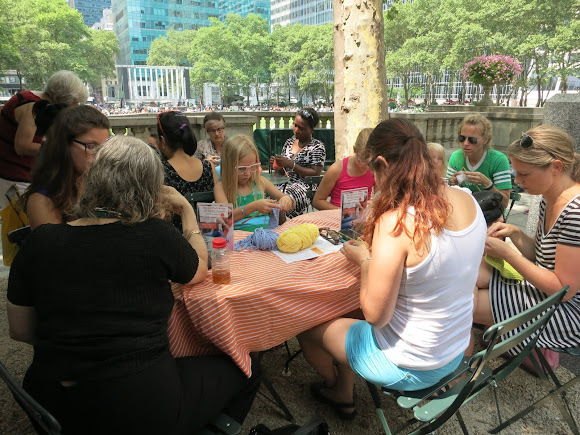 Bryant Park continues the spirit of Worldwide Knitting in Public Day with our weekly knitting classes. Join us on Tuesdays from 1:30 to 3:00 through August 25 for Bryant Park Knits, in partnership with Knitty City. Call 212-787-5896 to reserve your spot. Knitters of different stripes knit together.